grandma's cookie jar: crafting with grandma . . . Stained Glue Valentines Day Hearts! crafting with grandma . 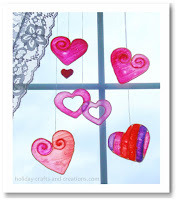 . . Stained Glue Valentines Day Hearts! From time to time I browse on Pinterest to look for ideas of projects I might try with my grandsons. A few years ago I found a wonderful craft which is perfect for Valentines Day - Stained Glue Valentines Day Hearts - and today I'm happy to share it with you! This craft would be great fun to make with your grandchildren over several days - and would make wonderful gifts for them to give to their parents, teachers or to anyone on their Valentines Day list! I'd list the supplies and directions for the beautiful hearts, but on the blog, Squishy Cute Designs, they provide all the info, plus step-by-step photo directions, so please follow this link and plan for a special time when your grandchildren are at your home - perhaps for a sleepover - and have fun making these hearts together! As you make these hearts with your grandchildren, talk with them about what love really is all about. Spend time with them praising and thanking God for His most amazing love and make a few extra hearts which you and your grandchildren could go and give to an elderly neighbor, someone you know who is in a nursing home or to your pastor!